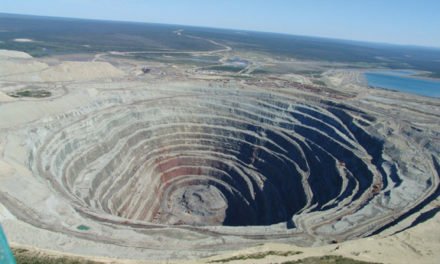 Blasthole drilling is one aspect of open-pit mining that engineers identified long ago as a promising area for autonomous operations. Unlike haulage and loading operations, which are much more dynamic and complex with several pieces of equipment interacting in a 3-D environment, drilling a blasthole pattern on a bench is a very repetitive process. Over time, the task has evolved from automated drilling operations to hole location via GPS to teleremote operations to today’s autonomous operations. 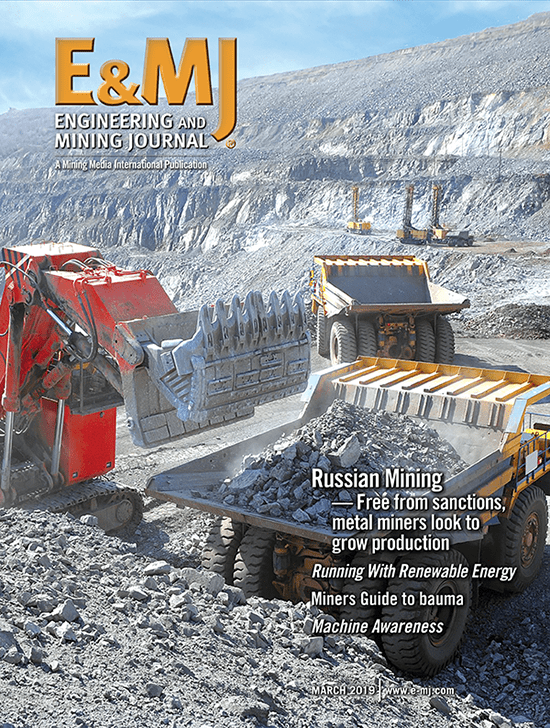 Much of the advances in autonomous mining operations are taking place among iron operations in the Pilbara in Western Australia. Rio Tinto and BHP Billiton have been investing a significant amount of money in automating operations in an effort to improve safety, reduce costs and improve the quality of life for their miners. During June, Atlas Copco announced that BHP had purchased 18 autonomous upgrade packages for their large rotary blasthole drills operating in the Pilbara. Ultimately, the goal with automation in this area is to drill a fairly accurate pattern consistently. Three key considerations for drill automation should be: safety, repeatable operations (consistency) and utilization. 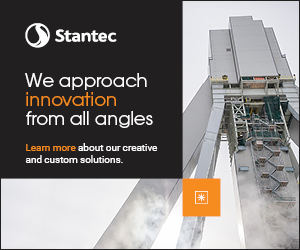 Not every open-pit mine is as easy to operate as the relatively flat iron ore operations of Western Australia. Similarly, not every mine operator is interested in fully autonomous operations. But, it’s safe to say that these days every mine operator is looking at ways to blast as much rock as they can with a consistent level of fragmentation at the lowest cost. Today, they can capitalize on some of the steps developed along the way toward full autonomy by tailoring a drilling program to meet site-specific needs. Manufacturers such as Joy Global confirmed that in the not-so-distant future, miners should expect to see more in this area of modularization. 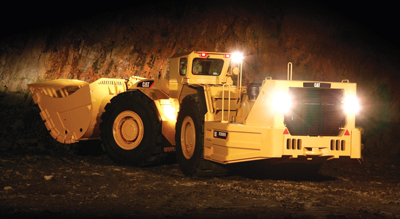 For the past two years, BHP Billiton has been running a trial of Atlas Copco’s autonomous technology on Pit Viper 271 rigs at the Yandi mine. The machines have operated autonomously for more than 15,000 hours and drilled more than 1 million m.
As a result of the successful trial, BHP Billiton has ordered autonomous upgrade packages for 18 drill rigs, in addition to a couple of machines already operating autonomously. The autonomous rigs will initially be controlled at BHP Billiton’s five iron ore mines in Pilbara, with the longer-term aim of remote operation from Perth, more than 1,000 km away. 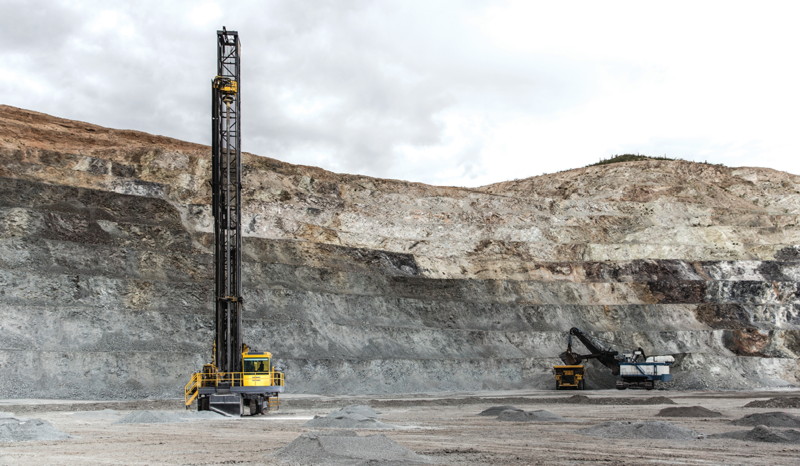 “We are committed to delivering the most innovative solutions that enhance customers’ productivity, and our autonomous drill rigs are a fine example of that,” said Johan Halling, president of Atlas Copco’s Mining and Rock Excavation Technique business area. Altogether there will now be 20 PV-271 autonomous drills deployed across BHP’s five Pilbara iron ore sites: Yandi, Mining Area C, Jimblebar, Mount Whaleback and Eastern Ridge. The rollout will occur in a staged process between now and July 2017. Atlas Copco has also been working with Rio Tinto on various drilling automation projects, Purvis explained. “It is understood BHP Billiton, while not as far down the autonomous haulage and data analytics paths than its Pilbara rival, is much further ahead on the autonomous drill front,” he said. At the Drill and Blast Summit in Brisbane in April, BHP’s mine automation readiness engineer, Jack Chaston, said autonomous drilling led to increased machine utilization and consumable life. He said the autonomous PV271s were 16% faster per hole, had 20% additional utilization and one-third extra drill capacity. BHP Billiton WAIO Asset President Edgar Basto said technology was having a significant impact on productivity across the industry. “Through our trial at Yandi, we were testing how this was going to work in our operations and making sure there was a business case, and then we started to see the benefits,” he said. “We were able to do this relatively quickly because they [Atlas Copco] had already done the work. “We are creating a safer working environment for our people…they will now be operating in our control room so we are driving collaboration with this. 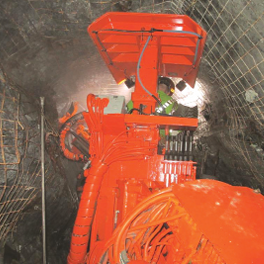 The Atlas Copco system is a modulated automation system that can be adapted from semiautonomous teleremote to fully autonomous operation depending on the mining operational requirement. All of the current Joy Global blasthole rigs use rotary tricone bits. With the recent MTI acquisition, however, the company gained access to most of the drill string components, including some down-the-hole hammer technology. “This is a new area for us and we’re exploring our options as far as hole diameters less than 8 in.,” Collins said. Joy Global plans to debut this new drilling system in a few months at MINExpo 2016. He said the idea for the backbone architecture was related to the innovative design that drives the patented Switched Reluctance Hybrid loader technology, which was discovered when the company acquired the Le Tourneau line of large front-end loaders. “Le Tourneau had some advanced technologies that we can use to help achieve a common control platform across all of the equipment,” Collins said. “If we have a service tech tracing faults and failures and each week the tech is moving between a drill, a hybrid shovel or an LHD underground loader, ideally the technician would be working with the same control platform. That would mean a huge improvement in efficiency. Plus, with a standardized offering, the technicians are using the same components and there is less inventory on the shelf, such as digital and CAN-analog cards that are common from one to the next. They can replace the existing system and the software file will make the modifications. “The backbone architecture is common against what we are doing right now and it has high computational ability for supporting teleremote and ultimately full-autonomous machine functionality,” Collins said. When the operators are not on the machine, they have to rely on horizontal and vertical vibration indicators. “We have been looking at rotary RPMs, pull down force, feed rate, bit air, rotary torque, and resultant vibration signatures to establish baseline settings for different geologic formations, essentially an Autodrill cheat sheet,” Collins said. The first machine in the company’s new product line, the 77XD blasthole drill, will debut at MINExpo as well. The numerical indicator “77” represents the bit load of 77,000 lb of force maximizing at 10 ft-5/8 in. (270 mm) diameter holes. 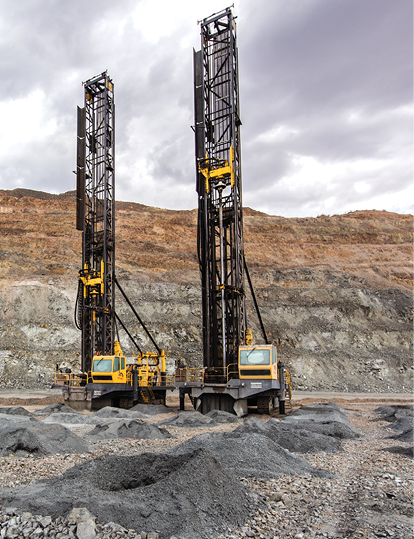 According to Collins, this versatile drill will have a variety of configurations to meet a variety of mining duty applications. The “D” included in the name represents diesel power, whereas the “E” in 77XE would represent an electric trail cable machine. Other options include rotary tricone or DTH hammer drilling, as well as single pass or multipass configurations. “We have whole bunch of new designs. We know where we fall short compared to the competition as far as cycle times, performance characteristics, etc.,” Collins said. An artist’s rendering of Joy Global’s 77XD blasthole drill, which will debut at MINExpo 2016. Collins sees the advantages of getting the best penetration rate with the least amount of additional features that do not add a lot of value. Compliance with different regional specifications is another positive aspect. The new machine will also have some additional safety features. “If you’re unfamiliar with P&H drills, it’s a P&H shovel that can drill holes,” Collins said. With the new machine and the drill automation program, Joy Global is keeping its customers top of mind.